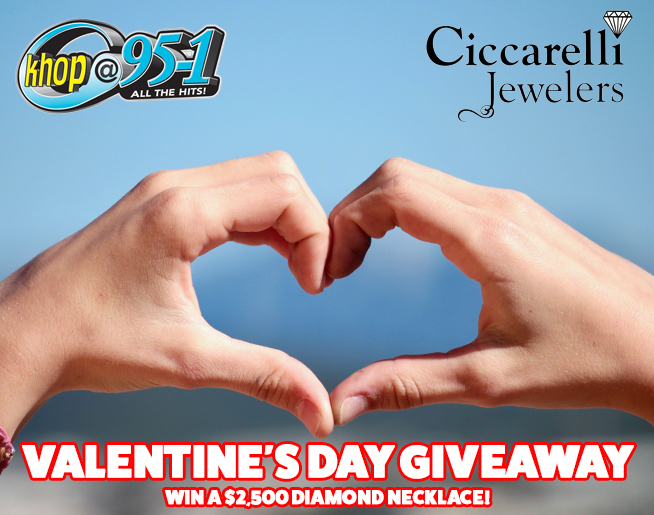 KHOP and Ciccarelli Jewelers in Modesto want to make this Valentine’s Day special one by giving you jewelry! Listen to KHOP M-F at 7a, 11a & 4p for your chance to win a beautiful pair of two-hundred-dollar diamond and opal earrings! Just text the Valentine’s Day keyword to 62582 when your hear it (standard rates apply). If you win, you’ll qualify for the grand prize…a dazzling twenty five hundred dollar diamond necklace with well over a half of a carat in sparkling diamonds. All from your favorite jewelry store, Ciccarelli Jewelers.